Assembly Member Ken Skates visited a local primary school to see the results of Welsh Labour Government investment. 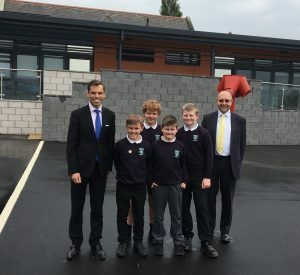 The Clwyd South AM was shown around the new facilities at Ysgol Penycae on Friday (May 25) and said he was proud that Welsh Government funding is benefiting pupils. “It was fantastic to see the new facilities for myself and I’m proud that Welsh Government is investing in children in Clwyd South,” said Mr Skates, who was given a tour by headteacher Tim Newbould. The renovation was made possible with funding the Welsh Government’s 21st Century Schools programme – the largest investment in Welsh schools and colleges since the 1960s. The programme aims to raise school standards and deliver an education system that is a source of national pride and public confidence. The work, carried out by Brymbo-based Read Construction, included creating four classrooms, a new school hall, improved kitchen facilities and a modernised play area.